Pump impeller is a very important component of a pump. Most of them are cast iron impeller. Normakky they are classified into four types: follow impeller, leaf blade impeller, screw centrifugal impeller and vortex flow impeller. Different use conditions need different iron materials. Normally the material of the water pump impeller uses grey iron or ductile iron. Oil pump impeller uses Ni-resist and so on. 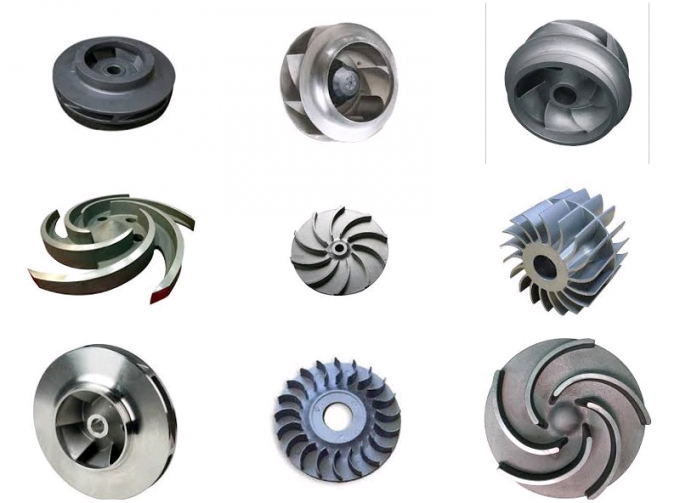 Equipped with advanced casting iron producing line, we can provide you pump impeller with high quality and competitive price. 1. Workpiece surface smooth, the transition smooth without cracks, creases and other defects. 2. Remove the sharp edges, burrs. 3. If not marked tolerances, we will in accordance with the data -0.25~+0.25. 4. Coated with anti-rust oil after cleaning the surface. 6. Surface can be galvanized and so on. iron, aluminum, steel,stainless steel,copper, bronze etc. Inspection Equipment three-coordinates measuring machine,Hardness-testing device,spectrum analyzer. Surface Finish chrome plating, spray-paint, sandblasting, powder coating, anodisation,etc. Our company have a large number of the Quality Control Engineers, and we also have a lot of high precision testing equipment. Dial bore gauges, Inside Micrometer etc. a good relationship with many foreign companies, especially in Japan, Europe, America and Southeast Asia. 2).We have a lot of high precise Machining equipment and high precision testing equipment, our manufactory also have a large number of engineers. we can provide the best products and the best service for you. 1).The delivery time and the package can be controled according to the customers' requirement completely. 2).we will produce the products seriously according to the drawings, and make sure all the products is suitable for the custoners. How can I get some samples of Iron casting,cast ductile iron,cast grey iron part? If you need,we will offer you samples for free,but new customers are expected to pay express charge. Do you provide customized parts? Yes,Customers give us drawings and we will manufacture accordingly. Can you make castings based on our sample of Iron casting,cast ductile iron,cast grey iron and cast steel part? Yes,we can make measurement based on your samples to make drawings.